Our team here at the Fletcher Valley Market is dedicated to bringing our customers and their families the freshest and healthiest foods available. 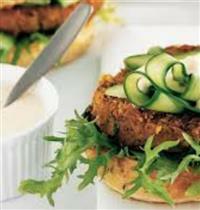 One of our favourite ways to enjoy great food is our recipe for lentil burgers. They are suitable for those who are on Vegetarian or Vegan diets. It is not only incredibly healthy - filled protein and essential nutrition, but also delicious and simple to make. It's great for lunch or a easy weekday dinner. All you need to do is to bring the lentils and water to a boil in a medium sized saucepan, Lower the heat, cover and cook for 30 minutes, or until the lentils are tender. Then drain for a few minutes. In a medium sized skillet, steam the onions, mushrooms and celery in the water. Make sure to keep stirring to prevent sticking. Then mix all of the ingredients together and shape them into patties. Cook on a lightly oiled skillet, or bake in a 350 oven for 20 minutes. Turn once to brown on both sides. Please use the Contact form on the right for Healthy Lentil Burger Patties Recipe information and ordering. Your message will be sent to Fletchers Valley Natural Foods only. Privacy & Anti Spam protected.